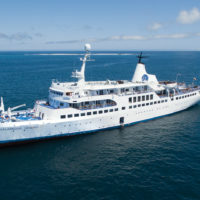 The 8-day Grace Galapagos Cruise itinerary includes visits to Santa Cruz, Santa Fe, South Plaza, Genovesa, Fernandina, Isabela, Santiago and San Cristobal Islands. M/Y Grace is an authentic classic adventure yacht for those seeking to explore the Galapagos in true style. Her history includes distinguished service in the British Navy during WWII and a pedigree that lays claim to ownership by tycoons, industrialists and royalty. Her comfortable and tastefully designed cabins offer full en-suite bathrooms. There are three levels on which to relax outdoors and under shade, while inside the yacht is fully air conditioned. 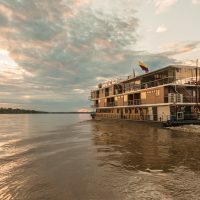 The main saloon, where your guide will give presentations on the each day’s activities, provides a relaxing environment with a full entertainment centre. An onboard boutique offers both necessities and souvenirs. M/Y Grace provides dining in both dining room and al fresco on the rear deck. At sunset, the happy hour on the top of sky lounge bar is an absolutely highlight. 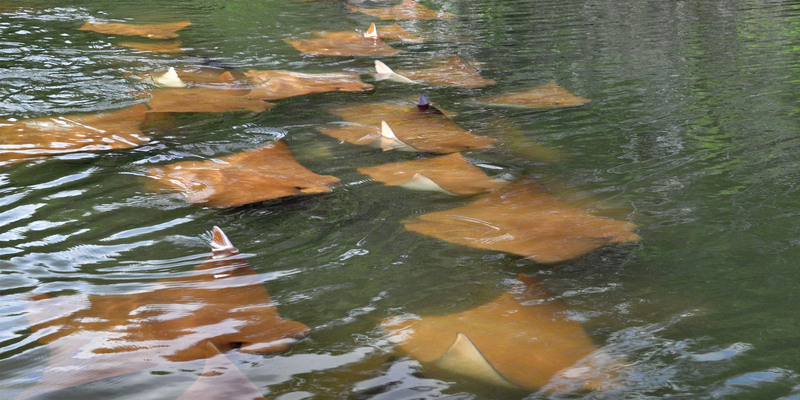 It is often accompanied by leaping dolphins and rays. Sea kayaks are available for some additional fun and we carry snorkelling gear for all. Morning arrival to Baltra Island by plane and immediate transfer to the dock to board your cruise. Welcome introductory briefing and lunch. 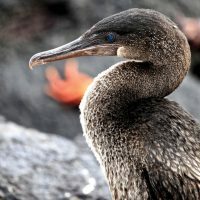 We will circumnavigate Daphne Major Islet which is home to a variety of birds including Galapagos martins, blue footed boobies, nazca boobies, short eared owls, red billed tropic birds amongst others. As the sun sets on your first day in the Enchanted Archipelago, you’ll toast to the voyage ahead with a welcome cocktail. Morning visit to Santa Fe Island, home to one of the most beautiful and sheltered bays of the archipelago, and to some of the best snorkeling – with its crystal clear waters. 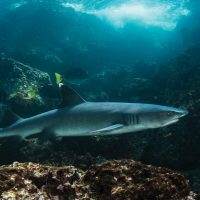 Certainly one of the best locations to see sea turtles, swim with sea lions and get a glimpse of the Galapagos White-tipped Shark. After a wet landing you will walk up to a nearby cliff to see the land iguanas through an area of Opuntia Cactus. Afternoon visit to South Plaza, one of the smallest yet most colorful islands in the Galapagos. Yellow land iguanas wander through bright red carpet weed, waiting from prickly pears to drop from green cactus. Orange sally lightfoot crabs dot the blackened lava above the landing site, all surrounded by turquoise waters. 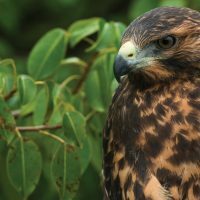 We’ll see swallow tailed gulls nesting along the up-tilted end of the tiny island, while red-billed tropicbirds, frigatebirds and shearwaters fly in dancing displays. You”ll also have the chance to see blue footed boobies along the cliff’s edge. The southern part of the island is an ocean-filled crater ringed by the throat of a sizeable and mostly submerged volcano. The island sits to the northwest, slightly apart from the Galapagos archipelago. It is also known as the “Bird Island”, a name that perfectly describes this location. Your first visit is to Prince Phillips Steps, the best Galapagos landing site to see red footed boobies, comically perched by wrapping big red feet around tiny branches. We walk a short distance to seek out short eared owls preying on swarms of storm petrels. Snorkeling on the Steps is amazing among large, brightly-colored tropical fish contrasting against the black lava background. 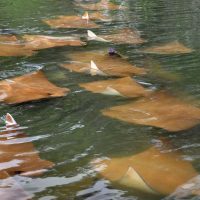 After lunch enjoy your time kayaking beside the walls of the sunken crater. Later, you will visit Darwin Bay. Time to visit a gorgeous cave; home to the nesting and soaring seabirds. Lastly, path leads up to the rookery cliffs for views of the bay and colonies of gulls, tropic birds and frigates. In the morning you will visit Fernandina Island, home to La Cumbre volcano, which erupts frequently (most recently in May 2005). 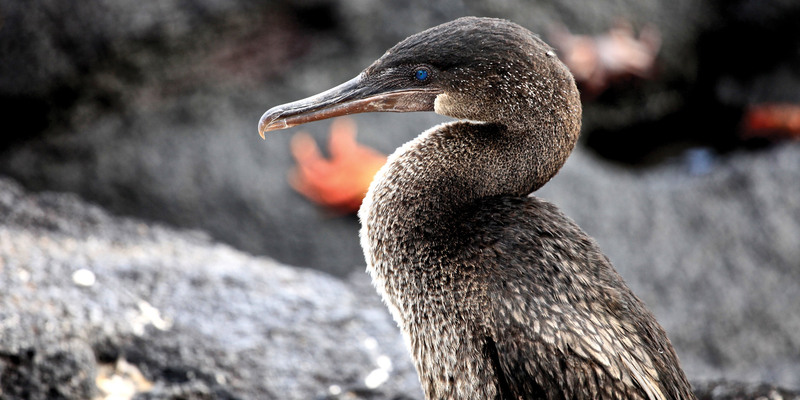 You also visit Punta Espinoza, a narrow spit of land, where a number of unique species, such as marine iguanas, sea lions, flightless cormorants, herons, egrets and Galapagos hawks can be seen in close proximity. Afternoon visit to Urbina Bay, directly west of Isabela’s Volcano Alcedo, where you will make an easy, wet landing (a hop into a few inches of water). You walk on a stretch of three kilometres of marine reef that has been uplifted by as much as 4 meters out of the water. 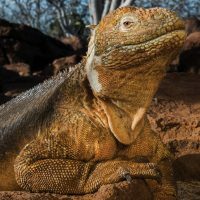 A highlight of this excursion are the giant land iguanas and giant tortoises, as well as the opportunity to go snorkelling amongst marine creatures or just relaxing on shore. Today, you have a morning visit to Tagus Cove on Isabela Island. A wooden stairway leads to the trail entrance and continues around Darwin Lake through a dry vegetation zone. The path ends in a promontory formed by spatter cones. The highland site provides spectacular views of our anchorage in the bay, as well as Darwin and Wolf Volcanoes. The green algae works as underwater pastures offering the chance to snorkel with marine iguanas, sea turtles, penguins and sea horses. 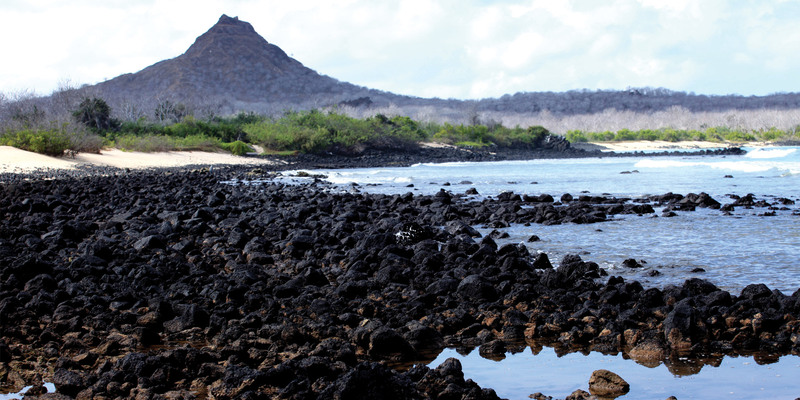 In the afternoon you visit Punta Vicente Roca on Isabela Island. 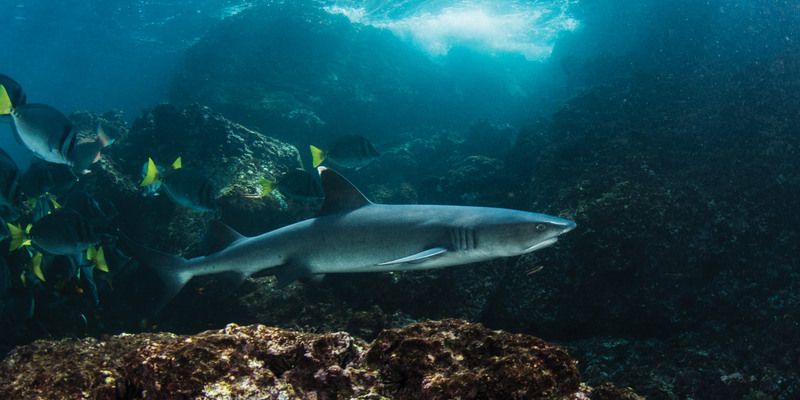 Snorkelling is incredible here as a result of the nutrient-rich waters of the Humboldt Current bathing the western side of the archipelago. You might have a chance to see colourful fish, sea lions, penguins and sea turtles in the water. A short walk in the beach leads to a mangrove typically inhabited by Common Stilts. Beyond the mangroves, there is a brackish lagoon where flocks of pink flamingos and white cheeked pintails wade in search of molluscs. The trail passes over a tiny hilltop through a sparse Palo Santo forest before looping back to the beach. 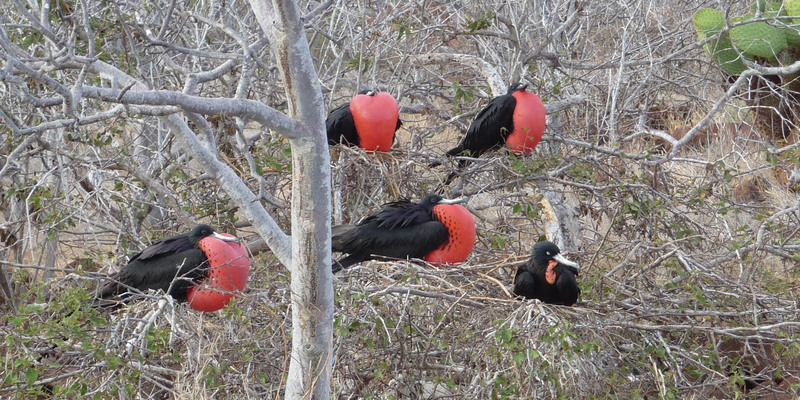 Galapagos finches and Vermilion fly catchers inhabit the area. The tuff formations that form the cliffs that have created a natural sculptor gallery, rising from the sea with formations such as the Monk and Elephant Rock. Afternoon visit to James Bay, where we land on a black beach with intriguing eroded rock formations. A trail leads to a series of crystal-clear cave with a natural bridge formed of broken lava tubes. 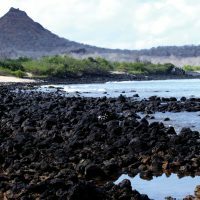 This is the best place in the Galapagos to see fur seals and samurai-like marine iguanas feeding in tidal pools nearby. 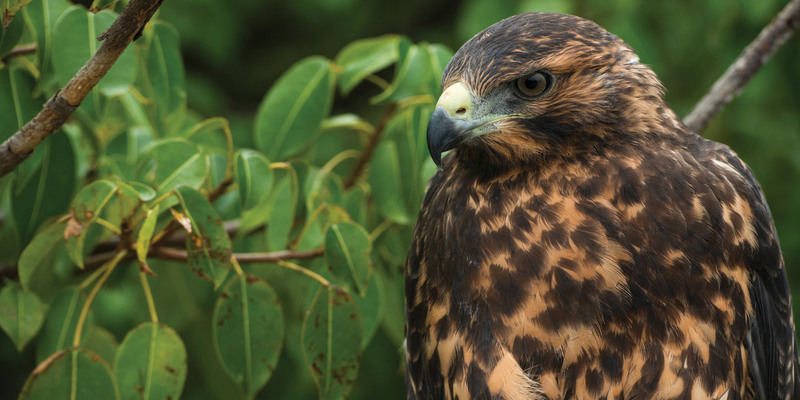 You will find a colony of sea lions here and Galapagos hawk usually visit the area. Snorkeling offers encounters with Green Sea Turtles and tropical fish. 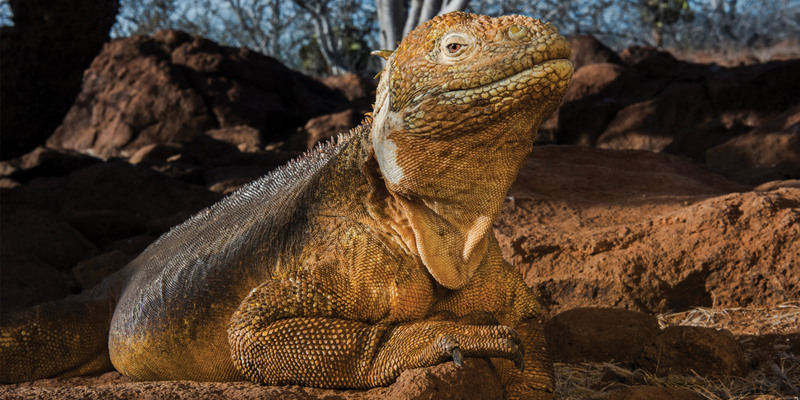 Today your Galapagos cruise comes to an end, but before we bid farewell to the Grace we visit the Galapagos National Park Visitor Centre that presents a comprehensive exhibit of the islands’ natural history, human interaction, ecosystems, flora & fauna. 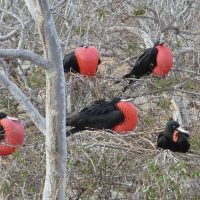 From the Centre, a short trail arrives at Frigate Bird Hill where both “magnificent-frigates” and “great-frigates” can be seen in the same colony. Next, we return to the airport where we began our journey in the Galapagos for the flight back to the Ecuadorian mainland.